Auto Disk, Pro Auto Disk, and Auto Drum Powder Measures along with their associated charge bar, disks, and drums. I am new to Lee and this forum. I am a bit confused. Easy to do by the way. I have a Lee Classic 4 hole turret arriving today. I am upgrading from a single stage Hornady setup to Lee turret. Which Lee powder drop works best for 9mm loads using CFE pistol or Win 231 powders? What is the difference between drum and disk units? 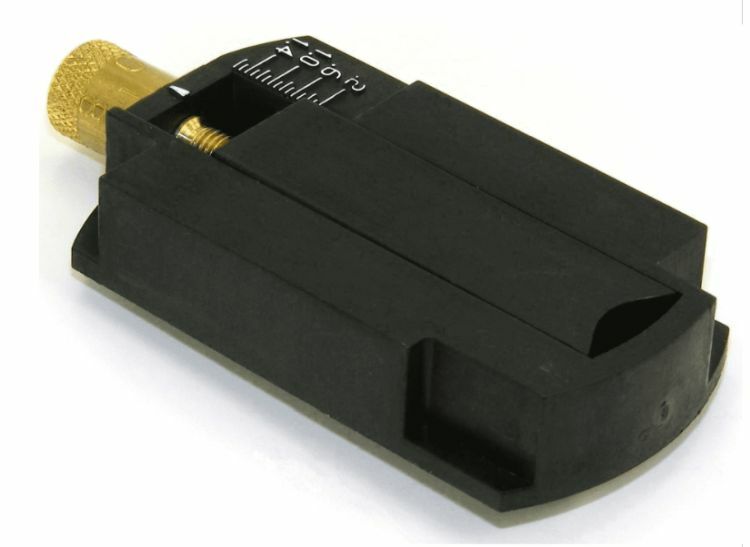 I also ordered the Lee 4 die set for 9MM because I like the idea of the separate factory crimp die after seating. RSODW wrote: Which Lee powder drop works best for 9mm loads using CFE pistol or Win 231 powders? My short answer would be to use the Auto Drum. RSODW wrote: What is the difference between drum and disk units? The Auto Drum provides for an infinite range of charges within an established min and max range. The Auto Disks uses a set of four six-cavity disks, their cavities graduating up in diameter. There is an Auto Disk and a Pro Auto Disk; the Pro adds an elastomer wiper and Teflon coated metal casting for better function, a powder shutoff, and a swivel adapter that makes the dispenser easier to mount and remove from a charging die (Powder Through Expanding Die in the case of the 9mm Luger). The swivel adapter can be added to the basic Auto Disk. The Pro has a double disk kit that allows you to expand the range of dropped charges. It is important to mention that Lee dispensers use cubic centimeters as their method of measure; whether Disk or Drum. The Auto Disk set includes a chart with most of the current powders that reflect what charge will be dropped from a given cavity on the disk. The stated charges are based on the specific gravity of the powder which can vary (up to 16%). Because of that, Lee provides instructions on how to calculate the Volume Measured Density of any given sample of powder. With the VMD and simple math, it is easy to determine the charge in grains, that any cc measure will deliver. The Auto Drum uses an adjustable drop, the drop controlled by a metering chamber within the drum, it's adjustable rod is calibrated in cubic centimeters. There are two sized of drums to cover a large range of powder charges. Easy to adjust for new loads. 1. Weigh the load you want on a scale. 2. Take the appropriate (large or small) drum off powder measure and adjust so that all the powder will fit into the cavity. 3. pour the powder into the cavity and turn adjustment till the powder just fills the cavity. 4. Put drum back on powder measure and fine tune. You can get extra drums cheep so that you can have some ready adjusted four your favorite loads. 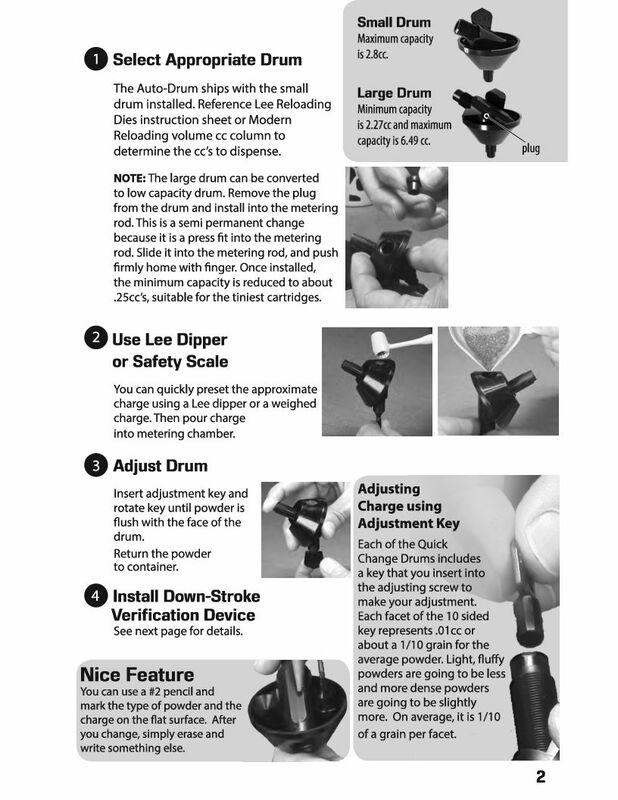 Here are the various methods for setting the Auto Drum's charge. I've used the VMD to cc calculation so long, 30 years (?) that's its second nature for me. I can hit a predetermined charge with a 10th of grain in seconds by counting the facets on the metering rod. I should have mentioned that there is an Adjustable Charge Bar that is available for the Auto Disk (90972). Believing the ACB had a lot a promise, I bought a bunch of them because I had a bunch of Auto Disks mounted on my presses. It did not pan out for me. I found the relationship of the cc increments not consistent with VMD and the drops not particularly tight. The problem with the drop is probably related to the charge being measured by the rectangular shaped opening (though the ends are rounded) vs. using a round hole. All those Auto Disks have been replaced with Auto Drums. Thanks very much for sharing your experience. I will get the lee auto drum no. 90811. I changed my mind for now. I have an RCBS chargemaster light. Using the 4 hole turret, I find that the timing is such that when the powder is measured, I am ready for it and dump it into a powder funnel inserted into the die. I kinda like that process and I also like the accuracy and consistency of the RCBS. Probably a little slower but that is not a problem with me. A nice feature of the AD that I find is that it keeps you (me) from double charging a round. Not a good thing for a small case like the 9mm! My AD is mounted on my classic 4 hole turret and I've loaded all my calibers from 9mm to 45 colt and have experienced consistency for all. farmerjim wrote: You can get extra drums cheep so that you can have some ready adjusted four your favorite loads. Scribe, just to check, I did double charge one case and the powder goes over the casing top so it is very noticeable when inserting the bullet. I also look into each case before inserting the bullet. You are right though. The RCBS was a Christmas gift from my wife so I probably better use it for a while. RSODW wrote: The RCBS was a Christmas gift from my wife so I probably better use it for a while.